Walt Disney Productions released an animated short film in 1937 entitled, “Hawaiian Holiday”. The cartoon cast of “Hawaiian Holiday” included Mickey Mouse, Minnie Mouse, Donald Duck, Goofy, and Pluto as they set out on a Hawaiian island getaway, complete with every laughable mishap that caused millions of people to fall in love with them, including Thomas Kinkade. As a life-long admirer of Walt Disney’s work, Thom often enjoyed re-creating many of the scenes and characters in typical Kinkade style. 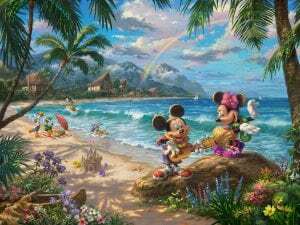 In celebration of the 80-year anniversary of this film, Thomas Kinkade Studio’s, inspired by the 1937 film, is proud to present their newest painting –Mickey and Minnie in Hawaii— as the first painting in the Passport to Adventure Collection. Beneath the rainbow covered mountains, one of Hawaii’s most beautiful beaches has become the party place for Disney’s most well-known cast of characters. As Minnie dances along to Mickey’s ukulele serenade, even the sea creatures draw near to listen. But as Donald and Daisy stroll along the beach and Pluto splashes in the waves, it is Goofy who steals the scene with his perfectly clumsy antics. 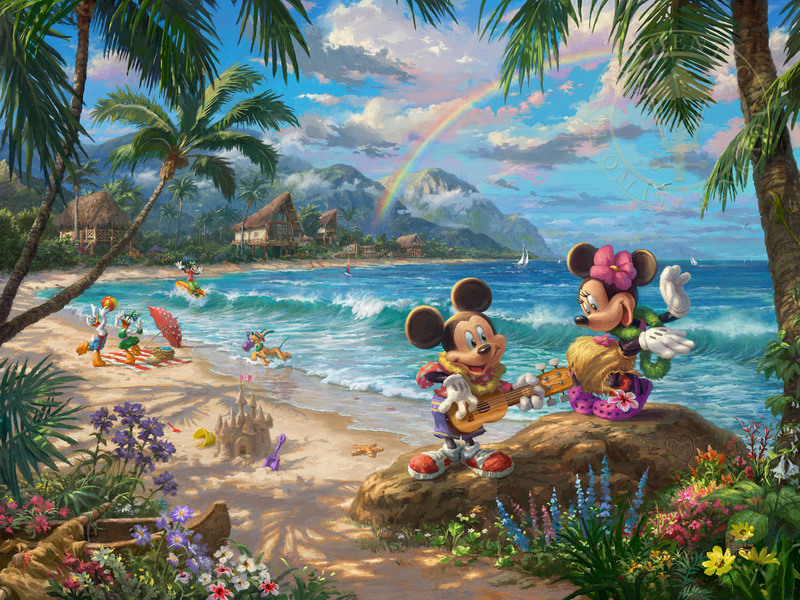 Mickey and Minnie in Hawaii is the fifth Thomas Kinkade Studios artwork that features Disney’s Mickey Mouse and Minnie Mouse together. This is the first piece in a new collection by Thomas Kinkade Studios; Passport to Adventure featuring the lovable duo.